Okay I have to admit, yes, eating and prepping home-cooked healthy meals are your best option for weight management and healthy living. But, let’s be real, sometimes after a long day or a very long week, dining out is just what you need. I am going to start a series and feature one or two chain restaurants each day. What I will do is check their menu and let you know what you can eat while there and remain true to eating PALEO as possible. 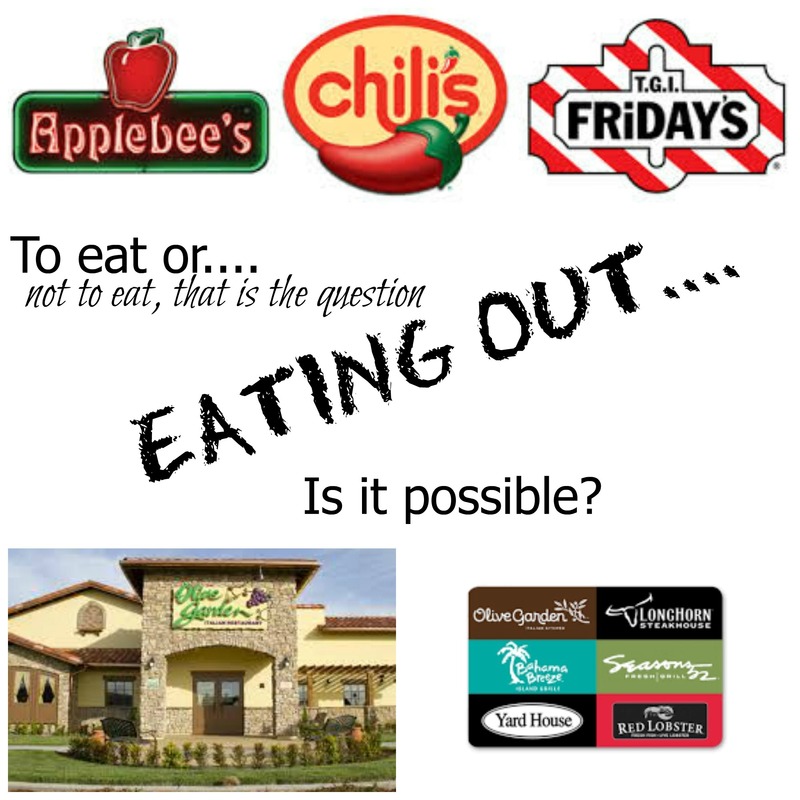 Dining out does not mean that you don’t have healthy choices. Let me help you figure out a better way to eat healthy while dining out. #1 when ordering salad, ALWAYS, ALWAYS, ALWAYS I can’t stress enough did I say ALWAYS ask for OLIVE OIL and vinegar. If they don’t have olive oil, I’d leave, LOL. Not really, but I would not order the salad because if they do not have olive oil they will bring you a regular vegetable oil or canola oil to the table and that stuff is POISON! I have in the past actually carried a tiny bottle of my own natural organic olive oil in my purse and brought it out if they tell me they do not have olive oil. The only problem with that is if it leaks, like mine did, it makes a mess. But, if you plan to go out it wouldn’t hurt to have a small bottle in a zip lock kept in your purse just in case. The reason I say this is because most commercial salad dressings contain HFCS (high fructose corn syrup) or sugar and other toxins. #2 IF you order something that has butter on it ask the wait staff taking your order if the chef truly uses REAL BUTTER!! Yes, you do have to specify, most restaurants will have a fake liquid oil with butter flavoring that they try to pass off to you as butter. It’s a disgusting chemically flavored agent that is not good to be ingesting, just trust me. If they can’t really specify if it is real butter and not margarine or some other unknown, then tell them to forget the butter. I will send out drip emails and feature one or two restaurants about twice per week. Of course they will be saved on here and you can always refer back to this page when you plan on going out. I fyou don’t see your favorite place on here, comment and ask me to add yours!! I always love trying new places and looking at their menus.